Last week, Jama Software launched Jama Connect Risk Management Center, which helps teams speed time-to-market without compromising quality or compliance. In our experience working with more than 200 medical device developers, we’ve realized how important it is to create best practices for risk management under ISO 14971, the FDA’s mandatory standard for risk assessment throughout the product development lifecycle. 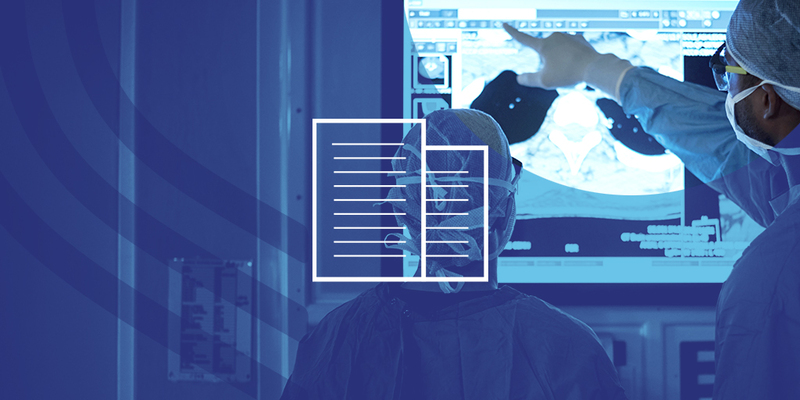 In this post, we’ll outline the main clauses of ISO 14971 and explain how Jama can help medical device developers build better, safer products that satisfy ISO 14971. ISO 14971 is a nine-part standard that sees risk management as a product lifecycle process encompassing development, production and post-production. Jama Connect™ offers a straightforward approach to managing risk according to ISO 14971 in one platform. Risk management is an inextricable part of the medical device development process. For medical device developers, risks are requirements. Risks may take different forms than requirements and may be more scenario-based, but they are a core principle of product development and should be tied together in one powerful platform. Many medical device companies continue to depend on Excel to capture risk data, but Excel simply can’t provide the end-to-end traceability necessary for satisfying ISO 14971. 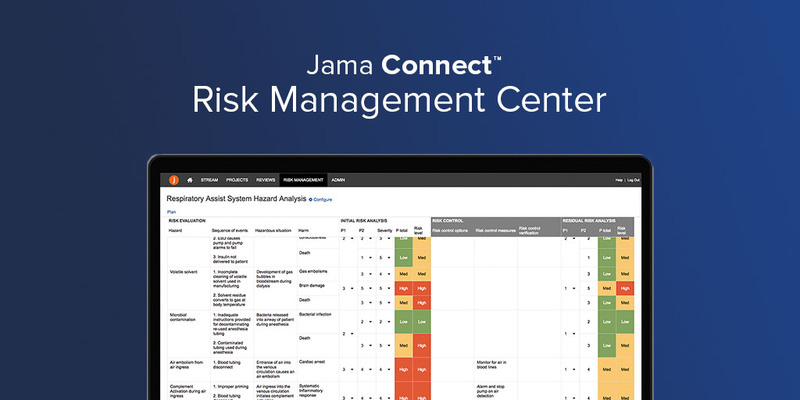 That’s where Jama Connect Risk Management Center comes in: It allows teams to easily connect risks, requirements and testing in one system where requirements and test results stay live in real time. 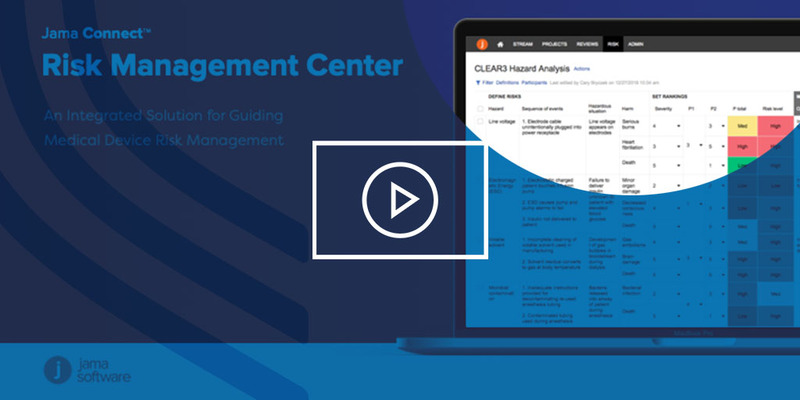 The Jama Connect Risk Management Center guides compliance with Clauses 4 through 7 of ISO 14971, which cover how risk should be managed throughout the product development process. Clause 4 of ISO 14971 requires that medical device developers identify potential hazards and hazardous situations. The Jama Connect Risk Management Center helps teams satisfy Clause 4 by defining device-specific hazards and capturing risk probability and severity. Teams can identify and evaluate potential hazards, sequences of events, hazardous situations and harms in a “tabbable” risk analysis table. Clause 5 requires the evaluation of risk for each hazardous situation and the definition of acceptability criteria for determining when risk reduction is required. To satisfy Clause 5, teams take the inputs from Clause 4 and determine the risk level for each hazardous situation. The risk analysis table allows users to determine the probability that the hazardous situation occurs or results in harm to a patient by assigning a two-sided P value (probability value) and a severity value. The resultant P total and risk levels give teams an at-a-glance understanding of the risk level of each hazard. Once defined, the risk acceptability criteria will automatically update the risk analysis table such that the probability of the hazardous situation resulting in harm is accounted for during evaluation. Clause 6 requires that risk control measures be developed, implemented and verified across the product development lifecycle. Risk control measures might include product design, preventative measures in the product and labeling. The risk analysis table lets users identify risk control options for a specific hazardous situation, such as inherent safety by design, protective measures in the medical device or manufacturing process, and safety information. Risk control measures, implementation verification, and verification of risk control effectiveness can also be accounted for in the risk analysis table. Clause 7 requires an evaluation of the medical device’s overall residual risk. If the overall residual risk is unacceptable, it must be demonstrated that the medical benefit outweighs the residual risk. When defining risk control measures, teams can capture those measures in Jama Connect and link them directly to risks before updating the rankings to determine the residual risk level. With traceability through all phases of risk, users can quickly identify potential pitfalls in the product development process and address them before they become bigger barriers to success. ISO 14971 requires a cohesive, well-documented narrative of your product’s lifecycle to assure the FDA that the device is safe, effective and compliant. Any decisions or actions that aren’t documented could keep your product from reaching the market or result in a recall. The Jama Connect Risk Management Center illuminates the risk management process while generating the documentation to support that narrative. Finding and fixing errors early in the product lifecycle saves money, speeds time to market and improves product quality. Jama Connect allows medical device developers to review risks and risk controls holistically, so that teams can operate with confidence.